Have you seen the hanging forest on Palm Jumeirah? 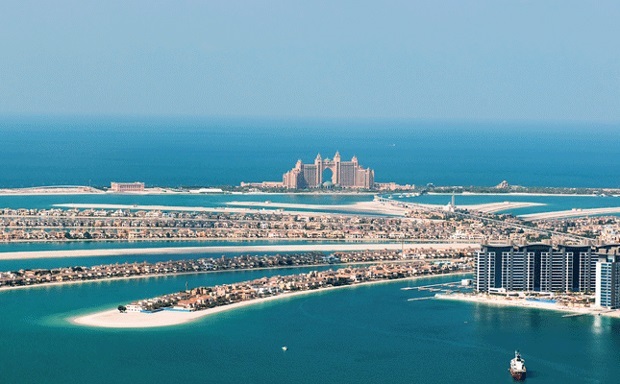 DUBAI In another first in the city, a bridge on Palm Jumeirah will have an artificial forest under it. Works are currently underway to cover the underside of the 326-metre Zabeel Saray flyover, including the columns, with artificial greenery. In all 4,000 square metres of space under the flyover will be covered with artificial fucis plastic leaves and tree barks made of white spiroform. “When done, it will appear as if the bridge is being supported by trees,” said Wisam Al Akkawi, architect and contractor for Ashekman, the company behind the landscaping work. He said the leaves have a wind resistance of up to 120km/h and will not change colour even in peak summer. “They are coated with cement and polymer. The landscape is completely fire resistant as it is made of hard-coating materials,” said Wisam on Monday, adding that the project will be completed in two weeks.